The ObamaMedia is beside itself right now .. it can’t seem to understand why or how Barack Obama’s economic policies aren’t translating into jobs and growth. This must be the case because they seem to be caught quite off-guard with all of these “unexpected” jobs figures. Unwilling to blame their savior, Barack Obama, they are now trying to come up with other ways to justify this lousy economy. I know … let’s blame the Republicans! Take a look at this headline: Are Republicans Intentionally Sabotaging Economy For Political Gain? Can you believe that? The headline doesn’t ask if Democrats are scaring the diapers off old ladies for political gain. Not, it’s the Republicans sabotaging the economy. Even though the Democrats held the presidency and the Senate since 2009 (the Democrats have held both houses from 2007 until last year), somehow it is all the Republicans’ fault. The Democrats haven’t presented a budget in how many years now? And it’s the Republicans who are sabotaging the economy? I believe based on the decisions that Obama has made as president, that he has a fundamentally different idea of what makes this nation and our economy great. He is a man who believes in a centrally planned economy and bigger government. How is that working out for us? If the rate of labor force participation in June 2011 were the same as it was in June 2009 (65.7%), the reported unemployment rate would be 11.2% rather than 9.1%. If June 2011 labor force participation were 66.2%, which is where it was when Obama promised that his “stimulus” program would prevent unemployment from exceeding 8.0%, the June 2011 unemployment rate would come in at 11.9%. Being a leader means taking ownership of your triumphs and your failures, but with the ObamaMedia in tow, Obama isn’t really forced to do that. ACORN, once a powerful advocate for low-income and minority voters, shuttered its operations amid plummeting revenues in March, six months after conservative activists posing as a pimp and prostitute caught on video some of the group’s employees offering them tax advice. In Miami, seven former ACORN voter registration canvassers were convicted of “false swearing-in an election,” and sentenced to probation and community service and banned from participating in future political campaigns, according to court documents. Do you truly understand what is happening tomorrow? Yup, tomorrow. Here we are … just one day away. The next 48 hours are surely going to be interesting. It seems certain that the Democrats are going to lose the House of Representatives. The question is by how much. Most analysts think the loss will be in the neighborhood of 50 seats. Some say it could be up in the 70s. This is by far the most important election in my lifetime. I’ve been doing talk radio for about 20 of these elections. Half presidential, half midterm. I can’t remember one this important. Getting rid of Jimmy Carter was important … but beginning the process of moving these radical leftist Democrats out of power may be even more important. This could be another voter revolution. Tomorrow stands as a tribute to our founding fathers. We are able to engage in revolution without leaving bloody footprints on icy roads or taking bullets in the chest. We can do this at the polls … but you have to show up for the fight. This revolution cannot be fought from a seat in front of a television set. Democrats know they’re toast … and are now trying to spin defeat. Now there’s something wonderful to behold … Democrats spinning defeat. Spinning it how? Democrats are now admitting that they’re going to get shellacked, but that it is all because of the economy. In a way they’re saying that yes, they’re going to be hit hard … but it’s all Bush’s fault. Later this week we’ll be hearing Democrats telling us that the economy caused them control of the House because the people were impatient and just wouldn’t give the Democrats the time they needed to straighten out the mess that George Bush left for them. Democrats also have another spin. They’re losing in this midterm election because the voters just aren’t all that bright. This is a line that has been promoted by both Barack Obama and by John Kerry. From these two we’ve heard that the voters just don’t understand facts and science. They’re scared and angry. Remember Obama’s “clinging to guns and religion” line? The spin here is that if the voters were just more appreciative of what the Democrats have done for them .. .and if they were just a bit smarter … and if they didn’t fall for simple-minded slogans so often … they would be keeping the Democrats in power so that all the problems created by the evil Republicans would be solved. But what about Republicans? Hopefully they don’t think that these voters are actually for them, do they? Voters are voting for Republicans for one reason … they’re NOT Democrats. As soon as the 112th Congress convenes in January the Republicans will be on instant probation. A repeat of the debacle after 1994 and the Republicans will likely never get another chance at this. It will be time for a 3rd party. But what really IS driving this election. Democrat consultant Pat Caddell says that this is the single greatest rejection of a president in his first term in our history. Gotta love that .. but why? ObamaCare, that’s why. Yes, there is high unemployment, but not high enough to explain this level of voter dissatisfaction. Maybe we ought to listen to the consultants … the Democrat consultants … on this one. ObamaCare. That was the killer. More than any other single issue this election is about the Democrat’s attempt to seize control of your health care. Yes … joblessness does play a role. Barack Obama made the tactical decision to focus on getting his healthcare bill passed – by any means necessary – rather than fulfilling his promise to focus on our economy like a laser. People struggling to find work didn’t get it. They had this inane idea that maybe The Community Organizer should worry more about the economy than his grandiose plan for a health care takeover. Well … ObamaCare was everything to The Chosen One, and now the voters will chose someone else. 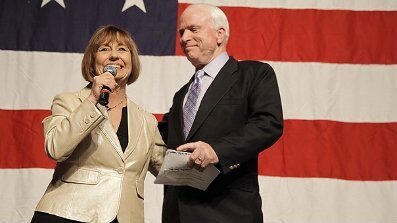 Sen. John McCain delivered a rousing endorsement Friday of Republican Senate candidate Sharron Angle and urged cheering supporters to send her to Washington as part of a historic turnaround in Washington power. A confident-sounding Angle, locked in a tight race with Majority Leader Harry Reid, predicted “there is going to be shock and awe in Washington” on Nov. 3, the day after the election. McCain, the 2008 presidential nominee, told the crowd at a Las Vegas casino that the “election will change America. The world is watching. “Sharron brings hope and Sharron brings action,” he said after embracing the former Reno legislator on stage, with an oversized American flag draped behind them. McCain’s appearance was intended to bolster Angle’s credibility, particularly with moderates, in a campaign in which Reid has relentlessly attacked her as a fringe conservative unfit for office. A succession of speakers, including actor and conservative activist Jon Voight, said her election would help turn back two years of Democratic policies that had damaged the nation’s standing at home and abroad. Across town, Reid was targeting Filipinos, the second largest foreign-born group in Nevada, at a crowded rally with popular Filipino boxer and congressman Manny Pacquiao. Reid and Pacquiao entered the room to chants of “Manny, Manny.” In a brief speech, Pacquiao endorsed Reid in his native Tagalog. Reid, a former boxer, denounced Angle’s conservative views, her criticism of Social Security, Wall Street regulation and public health care for veterans. Harry Reid intends to steal this election if he can’t win it outright. As a result, we need to deploy literally dozens of election law attorneys and poll watchers to combat these tactics at a cost of nearly $80,000. That’s over and above our current budget. We need to raise $80,000 and we need to do it RIGHT NOW, because even as I am writing this, Harry Reid and his Machine are trying to steal this election. I’m sorry that we have to come to you yet again and ask for you to reach deep and contribute, but we must. Understand, EVERYTHING we have worked for in the last year could be destroyed by dirty tricks and criminal acts in the next 8 days. As Sharron’s first line of defense on these matters I am absolutely committed to making sure this won’t happen. 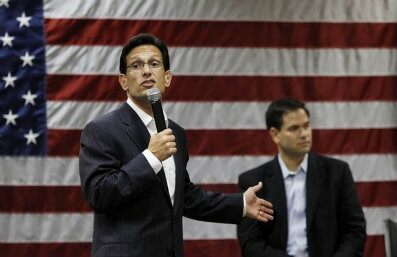 July 31: House Minority Whip Rep. Eric Cantor presents U.S. Senate candidate Marco Rubio during Rubio's campaign event in Fort Lauderdale. Democrats aren’t the only incumbents in trouble this November. With a crop of feisty, fresh-faced conservatives making noise in the House and a wave of Tea Party-backed newcomers determined to join them, senior Republicans could have a mutiny on their hands. The gap between the old and new schools of the GOP has become apparent as Election Day nears and polls show Republicans increasingly likely to pick up seats — lots of seats. Election guru Larry Sabato, at the University of Virginia, released new projections showing a possible 47-seat GOP pickup in the House. Gallup’s latest generic poll showed Republicans with a 10-point lead over Democrats in the fall, the largest gap in 68 years. The opportunity for a shakeup is ripe, but so is the opportunity for a makeover of the Republican Party itself. Establishment leadership likely were not thrilled to read about the contents this past week of the upcoming book being published by self-proclaimed “Young Guns” Eric Cantor, Paul Ryan and Kevin McCarthy — three ambitious young members of Congress who’ve been heading up recruitment of other like-minded wunderkinds for the party. Their book, “Young Guns: A New Generation of Conservative Leaders,” is due out Sept. 14 — a blueprint for America in the same vein as the policy book then-Sen. Barack Obama’s campaign released in 2008, only with the opposite prescriptions. PORT CHESTER, N.Y. – Arthur Furano voted early — five days before Election Day. And he voted often, flipping the lever six times for his favorite candidate. Furano cast multiple votes on the instructions of a federal judge and the U.S. Department of Justice as part of a new election system crafted to help boost Hispanic representation. Voters in Port Chester, 25 miles northeast of New York City, are electing village trustees for the first time since the federal government alleged in 2006 that the existing election system was unfair. The election ends Tuesday and results are expected late Tuesday. It’s the first time any municipality in New York has used cumulative voting, said Amy Ngai, a director at FairVote, a nonprofit election research and reform group that has been hired to consult. The system is used to elect the school board in Amarillo, Texas, the county commission in Chilton County, Ala., and the City Council in Peoria, Ill. Besides the forums, bright yellow T-shirts, tote bags and lawn signs declared “Your voice, your vote, your village,” part of the educational materials also mandated in the government agreement. Announcements were made on cable TV in each language. All such materials — the ballot, the brochures, the TV spots, the reminders sent home in schoolkids’ backpacks — had to be approved in advance, in English and Spanish versions, by the Department of Justice.